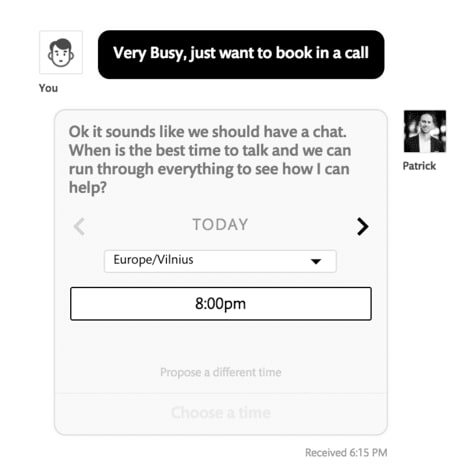 By removing live chat from their site and integrating real-time bots that can interact with visitors on multiple time-zones, Prospect Labs tripled their monthly sales to both UK and US markets. Sorry, your browser doesn't support embedded videos, you can download it and watch it with your favorite video player! Website pop-ups and automated messages were not working in the way I needed them to. They were too automated and not individual to the customer’s needs. My live chat software was instantly prompting the user to book a call to speak to me instead of educating the visitor on how I can help them and understanding what their pain points were. We work with startups both in the UK and the US. Having live chat on my site meant that I would be getting messages from 6am in the morning through to 11pm at night. The majority of conversations were not being responded to and I was losing valuable sales opportunities. During phone calls or meetings, I always ask potential clients a number of validating questions to learn more about them. This helps me to find out if they are the right fit for my services and how I can help them. I wanted a bot that could automate these questions for me. I know that if I can have a call with a potential client, 90% of the time they will convert into a paying customer. I wanted a software that could interact with a visitor and let them seamlessly book a call into my diary at a suitable time for them. Running a Lead Generation service for startups requires me to have an expert level of all growth-hacking and marketing software and I am always looking for new ways to improve. 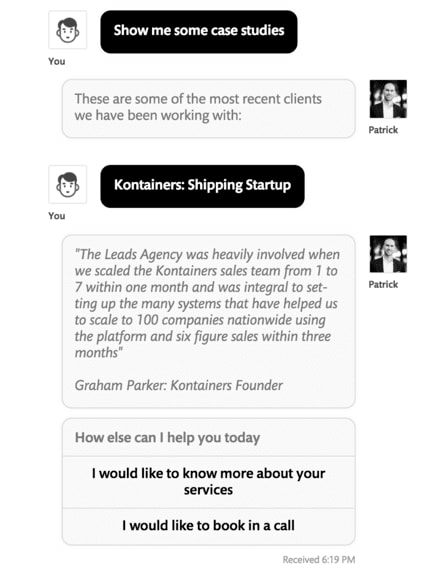 My preconception of ‘chat bots’ was that everything would be too automated and that by speaking to a bot would dilute the level of service I offer to a customer rather than improve it. 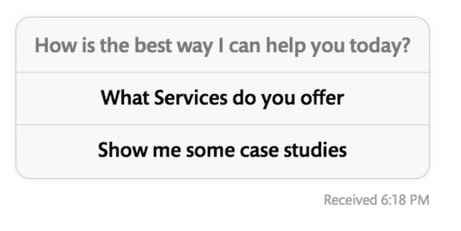 By creating a sequence of questions for the bot on my site, it made me realise the exact types of questions I should be asking to define the perfect clients. Now Continually is live on my site, I only speak to highly qualified leads as they have to answer a series of validating questions before they can book a call into my diary. By having a software that can adjust to what a visitor is looking for, I am speaking to less people, have more free time and making more sales. 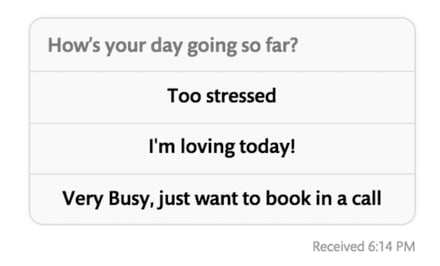 My site now asks visitors ‘how their day is’, it can make them laugh, it can show them bespoke case studies relevant to their industry, and it can let them book in a call. All of this is bespoke to how the user interacts with the bot. Signing up and getting started with Continually was all straight forward and once I had embedded the code onto my site, I began experimenting on what I could create. As soon as I had tested Continually, I felt I had to let the team know how excited I was! 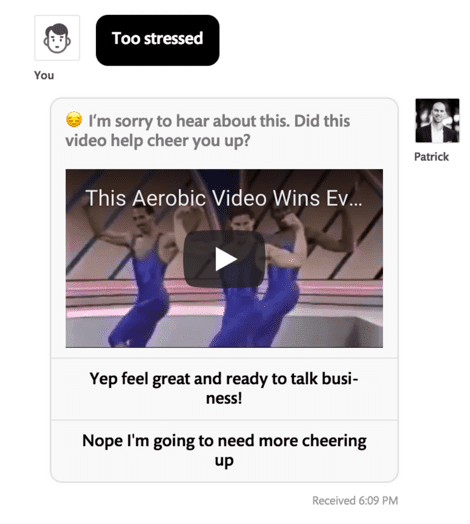 To see the chatbot in its entirety that I created please go to Prospect Labs and test it out. The only aim here is to be completely silly and light hearted - that is it! I think this video definitely helps (the moves on 24 seconds I am really trying to perfect). This bot is now building trust and making my website visitors laugh. I have spent years training sales people to have these skills and 4 hours of testing Continually and I had it! Are you trying to get more calls booked in, direct visitors to a certain page on your site or just to educate new users to the potential services and prices you charge? What is the tone of your messaging? Are you trying to make the visitor laugh, are you trying to keep their attention. Do you want to build trust or show how you compare with competitors? What information do you want to acquire of a visitor? Do you want to learn how a visitor found your site, or get their email address, name, or even what services they are interested in speaking to you about? What is the flow of your messaging? 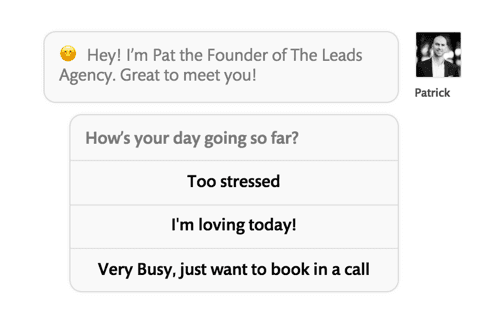 Do you want to make it easy for a visitor to book a call or do you want to direct them through a series of validating questions first?